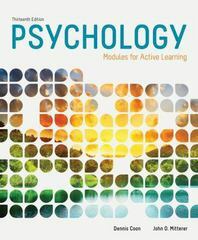 Psychology 13 Edition PSYCHOLOGY: MODULES FOR ACTIVE LEARNING combines the highly effective SQ4R (Survey, Question, Read, Recite, Reflect, Review) active learning system, an engaging style, appealing visuals, and detailed coverage of core topics and cutting-edge research in one remarkable, comprehensive text. Fully updated, the thirteenth edition of this best-selling book includes new and revised content, extensive special features, and integrated learning tools. While the book provides a thorough introduction to the study of psychology, its modular design and emphasis on how psychology relates to everyday life make it easy for readers to explore, enjoy, and ultimately master a wide variety of topics.